In turns out that polar bears are much more resilient to changing levels of sea ice than data collectors assume and the proof is in the current healthy populations everywhere. Freeze-up was late this year on Hudson Bay, no doubt about it. But some bears leaving for the ice at 7 December were still fat, even at the end of a longer-than-usual open water season in an El Niño year, because they had such a successful spring feeding season earlier in the year that they came ashore in excellent condition. Recall that we had a strong El Niño back in 1998? Have a look at the sea ice graph for NW Hudson Bay 1971-2016 (where Churchill is located) for the week of 11 December and you’ll see how much worse it was back in the falls of 1998 and 1999 – and in 1971 (and 1968) for that matter. 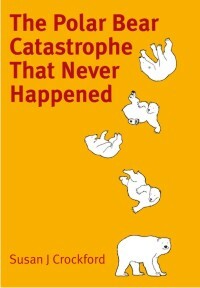 Those late freeze-up years were also bad news for polar bears as well but they had nothing to do with global warming. In contrast to this year, breakup in 1999 was early, which made the late freeze-up even harder for some bears (see this historic story from that year). Western Hudson Bay polar bear numbers have not declined since 2004 – the last count showed that numbers have been stable (with no trend in either breakup or freeze-up dates) and the official count is 1030. Anyone who says otherwise is deliberately spreading misinformation. There was another aerial survey this fall, which should put that nonsense message to rest because folks on the ground in Western Hudson Bay not committed to a message of doom are seeing lots of cubs and fat healthy bears. All the fat bears in Kaktovik, even after several months on land, is the “evidence” the doom-mongers use via the media to suggest the situation for Southern Beaufort polar bears is dire but their research results tell a different story. The data show that while there are indeed more bears onshore over the summer than there used to be in the 1980s, most bears (>60%) still spend the summer out on the ice. And those bears on land show no ill-effects (no increased mortality, no reduced cub production). You don’t hear about Chukchi Sea bears anymore – bears predicted to be most at risk of extinction – because the actual data show they are thriving with less summer ice. Fat bears reported in Svalbard and bear numbers up 42% over the 2004 count, despite poor sea ice in summer every year since then and also in the fall for many of those years. He doesn’t say what he thinks stops them from doing just that. The Russkies? Fear of the unknown, or a defeatist attitude to life? And yesterday he insisted that if Svalbard became “ice-free year round, it ceases to be polar bear habitat” showing a map that isolates Svalbard from the rest of the Barents Sea. As if “Svalbard” was a defined polar bear subpopulation – it’s not. As the map above shows, Svalbard is half of a subpopulation called “Barents Sea” for a very good reason: it has another archipelago similar to Svalbard in the east (Franz Josef Land) that polar bears are known to use for denning. And if you look at the recent Barents Sea ice map, it’s clear there is lots of ice further east and north (and that’s been true since late October). Ice forms in Franz Josef Land earlier in the fall than in east Svalbard – like it did this year (see maps below) and in 2012/2013, when the same thing happened. Barents Sea bears are known to range from the Svalbard area to Franz Josef Land and back but Derocher wasn’t there to see it happen back in the 1990s, so he’s convinced it never happens. Why would pregnant bears not shift over to Franz Josef Land this fall, as they clearly did in 2012 and 2013 (when there was no ice off Svalbard in fall)? Why do we know they moved? Because when the pregnant bears came back to den on Svalbard in 2014 (because the ice conditions allowed it that fall), there were 42% more of them for the biologists to count in 2015 and they were in great condition. If they hadn’t gone “somewhere else” in 2013 there should have been some evidence of high mortality by 2015 – but instead, there was a population increase. It seems there is no end to the resilience and adaptability of the polar bear, an animal with which those who work in the field view as a delicate flower or canary in a coal mine. The end-is-nigh messengers promote every perfectly normal skinny bear they see, every perfectly normal act of cannibalism, every perfectly normal bear searching communities for something to eat as some kind of “evidence” that life is not, by and large, good for most of the bears. Even in good years, some bears always starve (especially young and elderly bears, on the low end of the feeding hierarchy), a few cubs are always killed and eaten by males (that’s why mothers with cubs avoid males), and virtually all bears are always looking for food (even if they are already fat). And yes, there are more than average deaths in really bad ice years – but most often, those “bad” ice years have been years of ice that is too thick in spring (not too scarce in summer) or springs with too much snow over the ice (reducing hunting success for newborn ringed seals in their snow caves). But when the ice conditions have rebounded, so have the bear numbers – as they have always done (and as many, many animal populations do after bad years). Polar bear specialists fail in their predictions because they assume sea ice is a stable habitat – yet their own research shows it is not. Diverting the blame for poor hunting success in spring (e.g., for Southern Beaufort and Western Hudson Bay bears) onto loss of summer ice was bad science, whether intentional or not, because it generated predictions that failed. 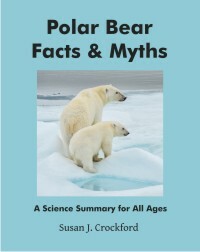 Buy Polar Bear Facts and Myths for your children, nieces and nephews and grandchildren because they deserve to know the truth too. Merry Christmas and happy Solstice to all. 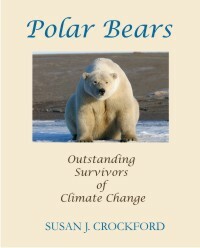 This entry was posted in Advocacy, Sea ice habitat, Summary and tagged advocacy, Beaufort, Chukchi, Churchill, declining population, declining sea ice, Derocher, extinction, facts, failed predictions, freeze-up, hype, Kaktovik, media, misinformation, myths, observations, polar bear, predictions, starving, Svalbard, threatened, USFWS, USGS, western hudson bay. Bookmark the permalink.